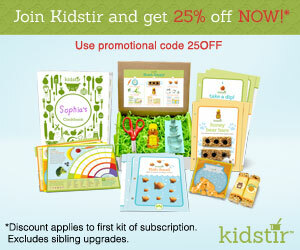 Home / Deals / Online Deals / Coupon Codes / Coupon Code for KidStir | Save 25% on Kids Cooking Boxes! Checkout this new Coupon Code for KidStir! This is a cooking subscription service for kids and right now you can save 25% when you use the coupon code 25OFF at checkout! My kids and I got a chance to check out the new KidStir program and it’s SO FUN! If you have a little baker in your house they will love this. These would also make Great Gifts! The second kit had 3 different recipes, all breakfast recipes! It even came with these cute Jams for Scones, a Grow your own Strawberries Kit and Silicone Cupcake Liners to make muffins! That’s three different recipes all in one box! I really think this is such a cute idea for anyone with kids that love to bake! You can try some new recipes + It’s such a fun (and useful) Box that you can get in the mail each month. I can’t wait to give our recipes a try! Thank you for the kidstir.com coupon code. Just used it to sign up and purchase the fish shaped cracker snack kit. OK! Magazine As Low As $0.19 per Issue!